I use a size K (6.50 MM) hook for everything accept the eyes and nose. For those I use an F (3.75 MM) hook. 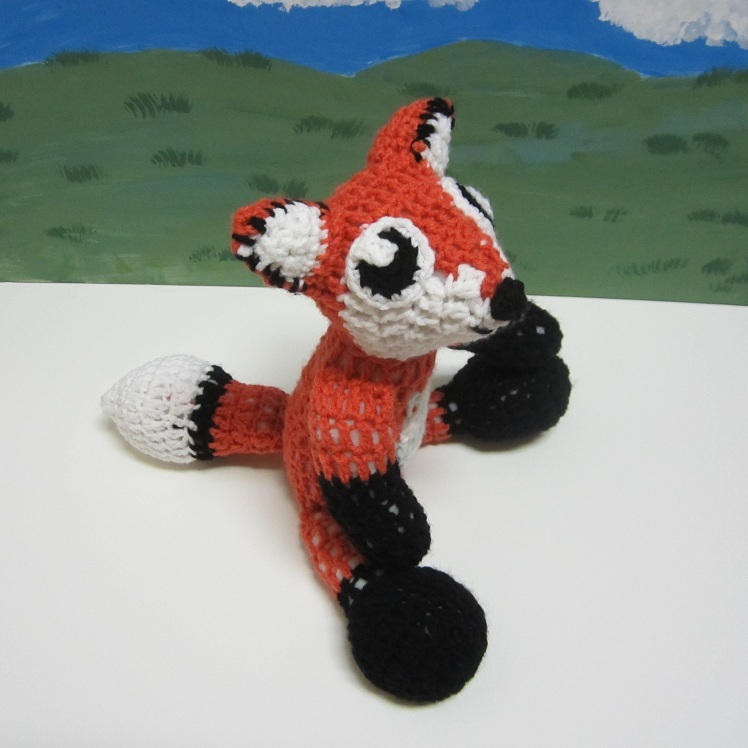 I use Red Heart yarn when I make this fox doll. Rnd 9: Ch 2, turn and work in opposite direction. Dc in same st, dec, dc, dec, dc, dec, dc, switch to color B, dec, dc, dec, switch to color A, dc, dec, dc, dec, dc, dec. Jn with sl st in first dc. Rnd 10: You can now fasten off the other rows as you go and use the color A strand you have at the end of this row to finish off the body. Ch 2, turn and work in the opposite direction so that the right side is facing you. Dc in same st and in the next 6 st, (fasten off and change to color B) dc in the next 3 st, (fasten off and change to color A for the last time), dc in the last 7 st. Jn with a sl st in first dc. Rnd 11-12: Ch 2, dc in next st and around. Jn with a sl st in first dc. (17 dc including first ch-2.) Fasten off. Use an F (3.75 MM) hook for the nose. Rnd 3-6: Ch 2, dc in same st and around. Jn with sl st in 1st dc. (12 dc not including first ch-2.) Fasten off. Rnd 7- 9: With orange, Jn with a sl st in any of the stitches of Rnd 6 and then begin to repeat Rnd 3 times. Rnd 7: Ch 2, dc in same st and around. Jn with sl st in 1st dc. (8 dc not including 1st ch-2.) Fasten off from black yarn and join orange yarn with a sl st in the same st as your last join on this rnd. Rnd 11: Ch 2, double crochet decrease around. Jn with a sl st in first dc. (6 dc not including the first ch-2.) Stuff tail. Rnd 12: Ch 2, double crochet decrease around. Jn with a sl st in first dc. (3 dc not including the first ch-2.) Finish stuffing and sew tail closed. Stuff arms and legs and close them the same as the tail. 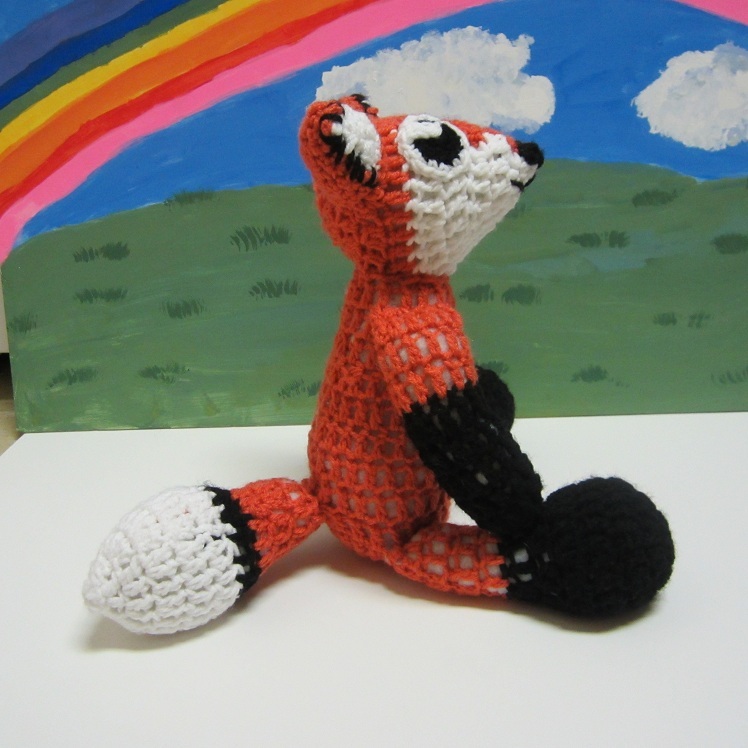 Sew the arms, legs, tail, and head to body. Row 5: Sc across. (2 sc.) Fasten off and weave in ends. Sew front of ear to back using black yarn. Work in continous rounds without joining. Rnd 4: (sc, dc) in 1st st, dc in next st, sc in next 2 st, (sc, dc) in next st, dc in next st, (sc, sl st) in next st. Fasten off leaving tail long enough to sew ear to head. Attach bottom of ear to the top front/back of ear while stuffing the ear. Sew ears to head. 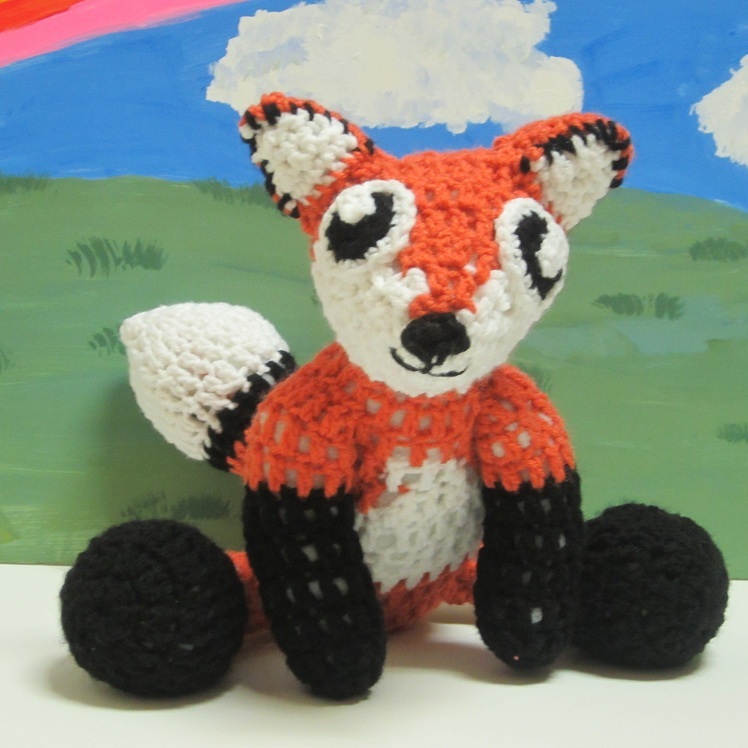 This entry was posted in Uncategorized and tagged children, crochet, crochet pattern, doll, emo, fairy tale, fox, Free Pattern, goth, kid, punk, scene, story book, teenager. Bookmark the permalink.